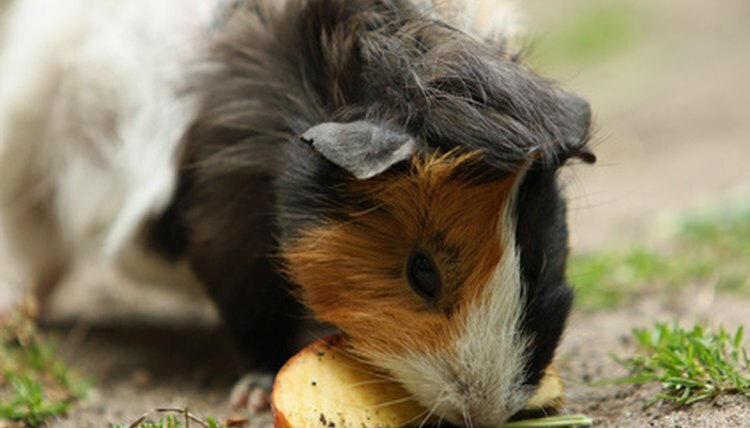 Unlike most animals, but similar to humans, guinea pigs can't manufacture vitamin C on their own and must have supplemental vitamin C in their diet. Most high-quality guinea pig pellets have vitamin C added in, but guinea pigs also like a variety in their diet. Guinea pigs are vegetarians who feed mostly on grasses in the wild. In captivity, however, they'll delight in fresh vegetables given as treats daily. The vegetables with the highest amounts of vitamin C include dark, leafy greens, bell peppers, broccoli, cauliflower and certain squashes. Broccoli, brussels sprouts and cabbage tend to make for a gassy guinea pig, so limit these to once per week instead of daily or frequently. Squash, red and green bell peppers and zucchini are acceptable sources of vitamin C on a daily basis. Fruits are an excellent source of vitamin C for humans and guinea pigs alike. While the vitamin C is high, however, so is the sugar. Fruits should be a frequent treat in small amounts, but too much can lead to problems, such as obesity, too much acid or high blood sugar levels. Strawberries, orange peel, mango and kiwi are all excellent sources of vitamin C. Kiwi and mango are extremely high in sugar, however, and should be fed sparingly, such as once per week. When shopping for guinea pig food, look for a pellet formula that has added vitamin C. Many food manufacturers now add this vitamin to their formulas for improved guinea pig health. The pellets should also be the base of your pig's diet, so the added vitamin C can go a long way. Your pig should eat approximately 1/8 to 1/4 cup of pellets per day split into a morning and evening feeding. When feeding veggies, try to give your pig three servings every day of different, healthy veggies. Examples of servings include one floret and stem of broccoli, 2 inches of celery, six large dandelions with greens or one slice of green or red bell pepper. Fruits should be served more sparingly, about once or twice per week. Give approximately 1 cubic inch of fruit in a serving.